Why Do Top Attorneys Stay at Boutique Firms? Sept. 21 — Fewer conflicts, less bureaucracy, and, well, happiness, are big perks of small firms, prominent attorneys who practice at boutique law firms told Bloomberg BNA. U.S. Supreme Court advocate and former U.S. Solicitor General Paul C. Clement and the boutique firm, Bancroft PLLC, most likely received a financial offer “they couldn't refuse” to join Kirkland & Ellis, but “I can't see” myself doing the same, Deepak Gupta, the founder of a top appellate boutique for plaintiffs and public-interest clients, told Bloomberg BNA. Kirkland & Ellis announced Sept. 12 that Bancroft's 17 attorneys would join its firm by Oct. 1, in time for the new U.S. Supreme Court term. “I enjoy what I do too much,” Gupta said. Gupta is founding principal of Gupta Wessler PLLC, an appellate boutique in Washington that represents plaintiffs and public-interest clients. Clement is the “best of the best” when it comes to Supreme Court and appellate advocacy, he said. Gupta said he admired what Bancroft had built, but wondered whether the attorneys feel “a “bittersweet-ness about” joining Kirkland. “I was surprised at how much I felt that” upon hearing the news, he said. The founders of two other nationally renowned boutique law firms told Bloomberg BNA that the freedom and happiness their practices bring them are why they stay small. “We couldn't be happier practicing in our small boutique firm, and have managed to resist the temptation to merge when the overtures have been made over the years,” Charles J. Cooper told Bloomberg BNA. 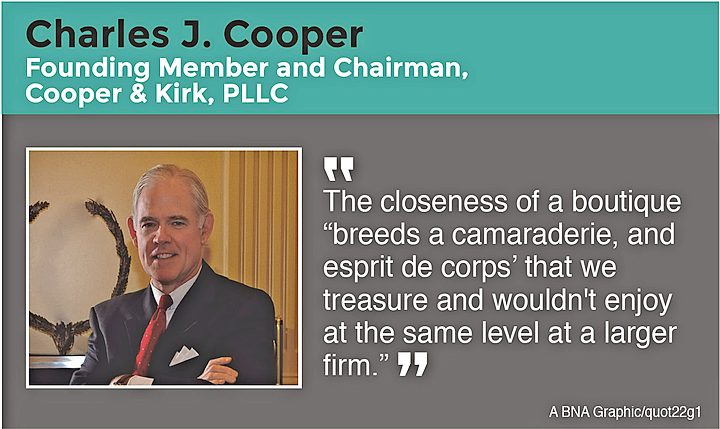 Cooper is a founding member and chairman of Cooper & Kirk, PLLC in Washington. When asked “why stay?” at the firm he founded instead of leaving for a larger firm, Thomas C. Goldstein echoed Gupta and Cooper's responses. “It's a better life, I'm happier,” Goldstein told Bloomberg BNA. 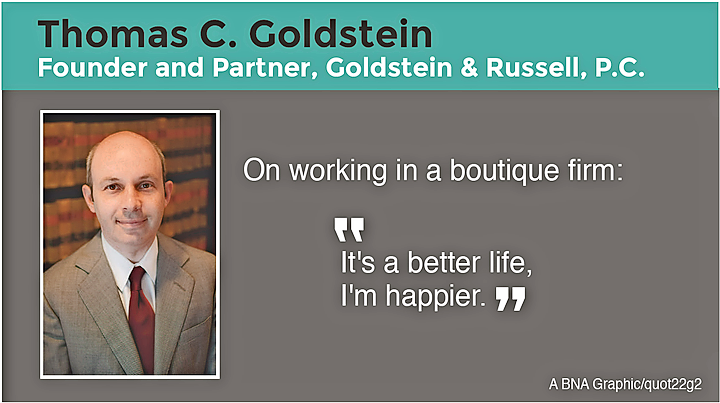 Goldstein is a founder of Goldstein & Russell, P.C. , an appellate boutique focusing on representation before the U.S. Supreme Court. Familiarity with colleagues and fewer conflicts make life simpler and are what keep Goldstein, Gupta and Cooper so satisfied with their work. Gupta said that boutique firm culture is a “more civilized way” to practice law. The collegial environment of small boutiques is “the best” environment to practice in, Gupta said. It can be different from the culture of large firms, Gupta said. You can't replicate the family-type atmosphere of boutiques at larger firms, even in practice groups at large firms, Cooper said. The closeness of a boutique “breeds a camaraderie, and ‘esprit de corps' that we treasure and wouldn't enjoy at the same level at a larger firm,” he said. Bigger firms do offer some benefits, Cooper and Goldstein said. Financial security and risk abatement are such benefits, Cooper said. Some practice areas boom when others lag, which helps a larger firm “even things out” but “those risks are magnified in a boutique,” he said. Larger firms can leverage their lawyers, which is a “huge financial incentive,” Goldstein said. Leverage refers to the ratio of associates to partners. The theory is that high leverage, if managed well, can translate to more profits for partners. Cooper said that the reality of a boutique firm is that you can't rely on leverage for economic success. Goldstein left his first firm, Goldstein & Howe, P.C., for Akin Gump Strauss Hauer & Feld LLP in 2006 in part because he needed the platform of a big firm to leverage his profile and because it made economic sense, he said. He returned to small firm practice five years later for reasons Gupta and Cooper also cite to as important benefits of boutique firm life: lack of conflicts and bureaucracy. Goldstein's principal client had a conflict while he was at Akin. “I couldn't represent them in any big way” while there, he said. Conflicts were a reason Cooper left Shaw, Pittman, Potts & Trowbridge in 1996 to found his firm. Conflicts are a problem for all firms, “but the larger the firm, the larger the problem is,” he said. Gupta said the lack of conflicts and bureaucracy allows him to take his practice “wherever” he wants it to go and to focus on the most interesting kinds of cases. Bureaucracy can prevent attorneys from getting work done. In a small firm, there aren't as many meetings, policies and layers “to filter things through,” Gupta said. There are “fewer people to account to and to justify the decision you make to,” Cooper said. This allows attorneys to be “more nimble about decision making,” Gupta said. Bureaucracy was one reason Goldstein left Akin. “I was doing a lot of management—more than I was working on cases,” he said. Small-firm life allows attorneys the freedom to focus on what they love to do. 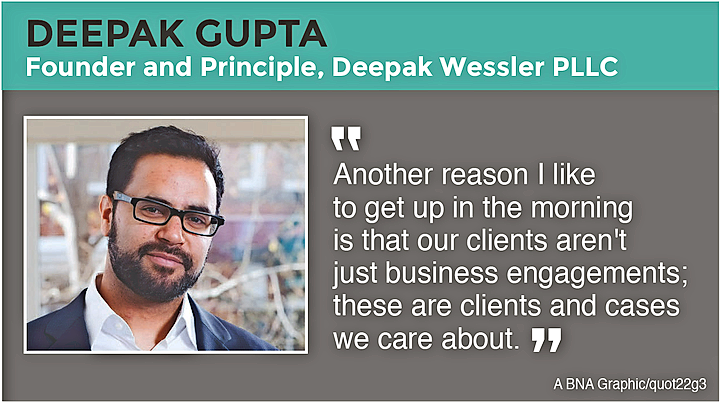 “Another reason I like to get up in the morning is that our clients aren't just business engagements; these are clients and cases we care about,” Gupta said. Gupta's firm doesn't take on a case unless the attorneys believe they're on the right side. “I don't think we'd have the luxury to do that anywhere else,” he said. “Bottom-line pressures” at larger firms might prevent them from turning down clients for such reasons or from representing clients when there's no guarantee of payment, Gupta said. A lot of Gupta Wessler's work is done on a contingency basis, so “there's no expectation” of payment, he said, but they do the work because they believe in it. Cooper founded his firm partly due to this freedom to pick and choose cases. A boutique gives “more freedom and flexibility to take on matters you believe are important even if you aren't compensated at the usual and customary fees,” he said. Goldstein agreed that money isn't the motive. “No one here is profit maximizing,” he said. “If everyone wanted to make the most amount of money, they'd go to a big law firm,” Goldstein said.